Oversight is an essential aspect of democratic government, an integral part of any system of checks and balances, and central to any effort to “watch and control the government.”2 Oversight is designed to improve the efficiency and effectiveness of the government, to detect arbitrary and capricious behavior, let alone illegal and unconstitutional conduct, to ensure compliance with legislative intent, and to prevent executive encroachment on legislative authority. Currently the Senate and House intelligence committees, which were created in the mid-1970s to ensure oversight of secret agencies, are observing all of these duties in the breach. Senate and House intelligence chairmen, Pat Roberts (R-KS) and Peter Hoekstra (R-MI), respectively, have become the cat’s paw of the Bush administration and have made sure that there is no accountability and no criticism of any actions of the intelligence community that could redound unfavorably on the White House. Over the years, the best-known examples of legislative oversight are the investigations by select committees into major scandals or failures. Recent examples of select committee inquiries have included “Watergate” in 1972-1974, intelligence agency abuses in 1975-1976, the Iran-contra affair in 1987, and homeland security in the wake of the 9/11 terrorist attacks. Standing committees have examined the sharing of intelligence information prior to the 9/11 attacks and U.S. intelligence on Iraqi WMD. But Congress’ current unwillingness to investigate the torture and abuse scandals, CIA secret prisons and extraordinary renditions, and the NSA’s conduct of warrantless eavesdropping indicates that the oversight process has atrophied. It was not until 1975 that the Senate Select Intelligence Committee (SSCI) and the House Permanent Select Committee on Intelligence (HIPSI) were created. The decisive event for the shift took place in 1973, when CIA director Richard Helms deceived the Senate Foreign Relations Committee, refusing to acknowledge the role of the CIA in overthrowing the elected government of Chile. Helms testified falsely that the CIA had not passed money to the opposition movement in Chile, and a grand jury was called to see if Helms should be indicted for perjury. In 1977, the Justice Department brought a lesser charge against Helms who pleaded nolo contendere; he was fined $2,000 and given a two-year suspended prison sentence. Helms went from the courthouse to the CIA where he was given a hero’s welcome and a gift of $2,000 to cover the fine. In the wake of the Senate (Church Committee) and House (Pike Committee) investigations of CIA abuses, the center of gravity shifted on Capitol Hill and large majorities in both houses favored the creation of select committees. Senator Harold E. Hughes (D-IA) and Representative Leo J. Ryan (D-CA) used the foreign authorization bill to add a requirement that covert actions, such as the operation in Chile, be reported to Congress. According to the Hughes-Ryan Amendment, covert actions could not be taken until a presidential “finding” was reported to the Senate Foreign Relations and House Foreign Affairs Committees as well as the Armed Services and Appropriations Committees of each house, which marked the first time that Congress specifically ordered the CIA to report anything at all. The Church and Pike Committees called for the creation of congressional intelligence oversight committees and, as a result, the Senate created the SSCI in 1976 and the House created the HPSCI in 1977. The era of intelligence oversight began when these committees claimed jurisdiction over the Hughes-Ryan amendment to the Foreign Assistance Act in 1974. Initially, the Senate Armed Forces Committee, the Senate Appropriations Committee, the Senate Foreign Relations Committee, and their House counterparts claimed equal oversight jurisdiction. But, in 1980, the Carter administration created the Intelligence Oversight Act that gave exclusive jurisdiction for oversight to the SSCI and the HPSCI. With the creation of the oversight committees, there was no question that the Congress had the power to monitor the performance of the intelligence community. The committees had the power to legislate on all matters related to the intelligence community. The intelligence committees authorized the budget of the intelligence community for action by the full Senate and had the power to investigate allegations of criminality, intelligence failure, and fraud and abuse. The committees could monitor the operations of the community, including covert actions, and audited all expenditures. Finally, the Senate intelligence committee confirmed the most senior officials of the intelligence community, and received prior notification of covert actions after the president had signed the “finding.” The committees could task intelligence community officials to supply sensitive information needed for oversight through printed reports, letters, testimony, and briefings. The final report of the National Commission on Terrorist Attacks Upon the United States (hereafter referred to as the 9/11 Commission) was particularly critical of the congressional oversight process, choosing to call the process “dysfunctional,” which is the same term the intelligence committees have used to describe the CIA and the intelligence community.4 Over the past two decades, we have witnessed a series of intelligence failures (e.g., the Soviet intelligence failure, the Indian nuclear testing failure, 9/11 itself, and the run-up to the Iraq War), but there has been no attempt by either the House or Senate to consider serious reform. The congressional intelligence committees neglected to push for investigations of the abuse and torture of detainees in CIA prisons and other overseas facilities. Senator Carl Levin (D-MI) has won no Republican support for his proposal to create an independent commission to investigate treatment of detainees since 2001. The administration’s rejection of accountability for numerous cases of “cruel, inhuman, and degrading” treatment of foreign detainees, and the congressional failure to conduct oversight hearings, is a shocking and shameful scandal in its own right. There has been no investigation of Secretary of Defense Rumsfeld, his senior staff, and White House and Justice Department lawyers who drafted or approved policies for detainee interrogations. There has been no investigation of CIA personnel, ranging from former director Tenet to operational personnel in Afghanistan and Iraq, who have been involved in the illegal hiding of “ghost detainees” from the International Red Cross and the “rendition” of suspects to countries that practice torture. As a result, little or nothing is known about such CIA practices as where prisoners are held, how many there are, what access they have to medical treatment, and how many may have suffered injury or death while in the agency’s custody. The dereliction of oversight reached its apogee in late 2002 when the Senate and House intelligence committees made no serious attempt to vet the intelligence analysis of the October 2002 National Intelligence Estimate on Iraqi weapons of mass destruction. Members of the Senate intelligence committee had commissioned the estimate, which is unusual in itself, but few members took the time and effort to read the finished product or to react to the CIA’s unclassified “white paper” of the NIE, which omitted the caveats, subtleties, and dissents from the classified version. The White Paper was aimed at a domestic audience and represented policy advocacy. The NIE said that Iraq probably could not acquire a nuclear weapon for at least seven years, but the White Paper left out the dates and suggested that the weapon could be acquired imminently. The NIE contained a dissent from the State Department on this issue, but the White Paper omitted the dissent. The NIE incorrectly stated that Iraq was aggressive trying to obtain high-strength aluminum tubes for its nuclear weapons program, and the White Paper downplayed the dissent from the Department of Energy, the most authoritative government agency to report on such developments. An excellent example of the lack of interest and curiosity of the oversight committees is the most recent oversight failure. In December 2005, the New York Times reported that the Bush administration ordered the National Security Agency in 2001 to begin warrantless eavesdropping of American citizens, a violation of law and possibly the Fourth Amendment of the Constitution against “undue searches and seizures.” Bush cited his inherent constitutional authority as commander-in-chief and the congressional resolution in the wake of the 9/11 attacks that authorized use of force. The president and Attorney General Alberto Gonzales also argued that they briefed Congress a dozen times on warrantless wiretapping, but the briefings actually involved eight of the 535 members of Congress. 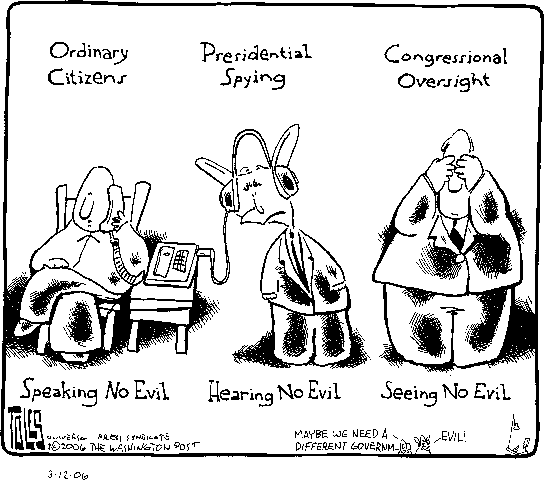 It took riveting testimony to the SSCI in 1986 to break open the illegality of the Iran-contra operation; it will take similar testimony to get to the bottom of the executive order to sanction the NSA’s use of warrantless eavesdropping against American citizens. Reform of the oversight process could be accomplished in large part by enforcing the system that already exists. The congressional intelligence committees have great powers that have been increasingly observed in the breach. The committees legislate on all matters relating to the intelligence community, including the most sensitive aspects of covert action; authorize the budget of the intelligence community; investigate allegations of failure and fraud, let alone criminality; confirm key members of the community; and have access to sensitive intelligence, including reports of the Inspector General. The oversight committees may not be able to veto a covert action, but it is possible for them to deny the funding for specific covert actions. It would be foolhardy for the White House and the CIA to proceed with a covert action that Congress opposed. The 9/11 commission suggested important reforms for the oversight process, but all of them were ignored by the committees. The powerful rule of the Senate intelligence chairman, Senator Roberts, moreover, has kept the committee from investigating key areas that point to an abuse of power by the White House over the use of intelligence or by the intelligence community itself. He recently promised once again to hold “closed meetings to move forward” on the administration’s manipulation of intelligence, but gave no indication of when factual findings would be published. With the exception of Senator Carl Levin (D-MI), the Democratic minority has been extremely dilatory in pursuing its legitimate interests on intelligence matters. In the House, Representative Jane Harmon (D-CA) has been no more aggressive than her Senate counterpart, and has deferred unnecessarily to the Republican chairman, Representative Hoekstra. 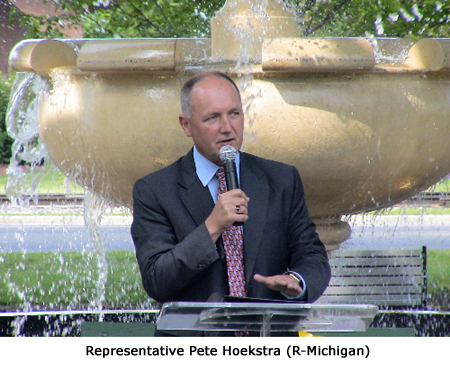 In a short period of time, Hoekstra has become the same “advocate” for the intelligence community that his predecessor, Representative Porter Goss (R-FL), had been. 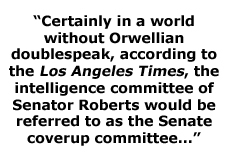 Roberts has single-handedly kept the committee from investigating the Bush administration’s use of the CIA’s intelligence information in the run-up to the Iraq War in March 2003 and the administration’s warrantless eavesdropping program. Although the Bush administration has resorted to a flimsy legal defense to conduct warrantless surveillance, citing the authorization to use force in Afghanistan in September 2001, Roberts has done nothing to examine the NSA’s activity, which is an obvious violation of the 1978 Foreign Intelligence Surveillance Act, if not the prohibition contained in the Fourth Amendment of the Constitution against “unreasonable searches and seizures.” President Bush and Senator Roberts are essentially collaborating to get Congress to pass a bill ex post facto to render the surveillance legal under the previous FISA authority. Roberts also dragged his heels in investigating the bogus intelligence of the CIA on Iraqi weapons of mass destruction and finally relented only after an outside commission headed by former senator Charles Robb (D-VA) and Judge Larry Silberman was appointed to investigate the matter. 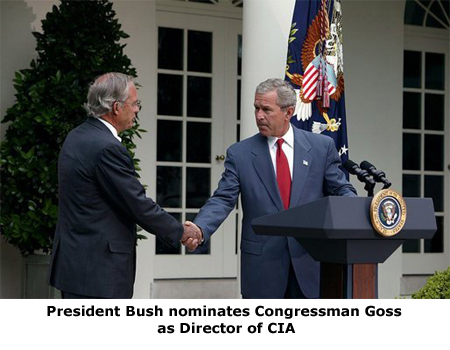 Roberts and former CIA director Porter Goss also collaborated on the cover-up of the CIA Inspector General’s accountability report on the 9/11 intelligence failure, preventing proper distribution of the report within the intelligence committees of the Senate and House as well as a sanitized unclassified report, which is customary in such events. Rep. Hoekstra has maintained the same partisan lock on the House intelligence committee that Roberts has placed on the doors of the Senate intelligence committee. Just as Roberts has blocked inquiries and investigations of such illegal activities as warrantless eavesdropping and torture and abuse at secret prisons, Hoekstra has made sure that the House committee doesn’t open any of these Pandora’s boxes. Ironically, the House of Representatives has a procedure that permits any congressional committee to obtain factual information—not opinions—from the executive branch.7 The procedure was used during the Vietnam War to obtain access to the “Pentagon Papers,” the Defense Department study of U.S.-Vietnamese relations, and information on CIA covert operations in Laos.8 When the United States fought a secret war in Cambodia during the Vietnamese War, it took a congressional inquiry to learn the number of U.S. sorties and the tonnage of bombs and shells fired and dropped during certain periods. A month before the Iraq War, Representative Dennis Kucinich (D-OH) used a resolution of inquiry to obtain a 12,000-page Iraqi declaration on its weapons of mass destruction, which turned out to be far more accurate than CIA declarations on Iraqi WMD. A resolution of inquiry would be an effective device for gaining more information on such controversial issues as CIA extraordinary renditions and secret prisons, which Hoekstra refuses to investigate. Meanwhile, the intelligence committees have not challenged the efforts of the Bush administration to restrict the need to know of the American people. In 1999, four years after the Clinton administration signed a declassification order, the CIA, the Defense Intelligence Agency, and several other agencies began removing thousands of historical documents from public access, including documents that had been published by the State Department and photocopied by private historians.9 Some of the documents were decades-old reports from the Korean War and the early days of the Cold War. The Bush administration accelerated the process when it came into office, and the impact of the 9/11 attacks put the program into high gear. The program has revoked access to approximately 9,500 documents since its inception, and more than 8,000 of these documents have been removed since the Bush administration came into power. There clearly has been a marked trend toward greater secrecy in the Bush administration that has increased the pace of classifying documents, slowed declassification, and discouraged release of some material under the Freedom of Information Act. The CIA under Porter Goss went even further, denying publication of materials that have no security classification and preventing CIA officials from addressing open meetings of academic associations. He also threatened the possibility of grand jury investigations in which reporters would have to reveal their sources of classified information or risk prosecution for espionage. Meanwhile, the intelligence committees have done nothing to challenge the efforts of the White House to shut off the flow of national security information to the American public. The White House and the Department of Justice are even using an espionage law from the days of World War I to prosecute two pro-Israeli lobbyists for receiving classified information from a Pentagon official who was sentenced to twelve years in prison in January 2006. The two lobbyists, Steven Rosen and Keith Weissman of the American Israel Public Affairs Committee, are facing jail sentences that would have a chilling effect on debate over national security issues. This would represent the first time that any administration has tried to stifle debate on national security issues by criminalizing the receipt of oral information as part of a lobbying or reporting process. In addition to blocking any serious investigations of the misuse of intelligence, the Senate and House intelligence committees also have blocked the Government Accountability Office, the investigative arm of Congress, from monitoring the effectiveness of the nation’s intelligence agencies. The GAO is uniquely qualified to investigate the world of intelligence; it has more than 150 officials who are able to audit intelligence information, but it has not audited the CIA or the NSA since the 1960s. In the mid-1970s, the Pike Committee, which investigated the intelligence community recommended that the GAO should have the same authority to investigate and audit intelligence as other agencies. But the GAO needs authorization from Congress to begin an investigation, and the oversight committees have been particularly quiet since the intelligence failures that accompanied the 9/11 terrorist attacks. Both Roberts and Hoekstra have stated that they have their own audit staffs within the intelligence oversight committees and have no need for GAO involvement. Unless the congressional oversight process returns to its bipartisan or nonpartisan roots, recruits an expert professional staff with the instincts of junkyard dogs, accepts the fact that objective, balanced intelligence analysis is just as important as clandestine operations, and appoints chairmen who do not see themselves as “advocates” for the intelligence community, the CIA and other intelligence agencies will not receive the guidance and monitoring they sorely require. With the dangerous increase in unchecked presidential power and the incompetence of the intelligence community prior to the 9/11 attacks and the Iraq War, the restoration of congressional intelligence oversight is essential to American national security. 1 Pat M. Holt, “Congress Partly to Blame for Bush’s Warrantless Wiretaps,” Christian Science Monitor, January 5, 2006, p. 15. 2 John Stuart Mill, Considerations on Representative Government, London: Parker, Son, and Bourn, 1861, p. 104. 3 Mark M. Lowenthal, Intelligence: From Secrets to Policy, Washington, DC: The CQ Press, 2000, pp. 141-142. 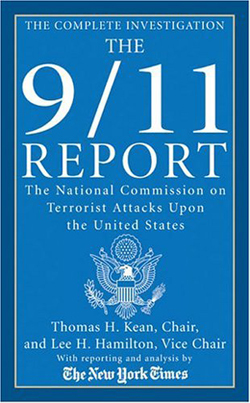 4 See The Final Report of the National Commission on Terrorist Attacks Upon the United States, Washington, DC: U.S. Government Printing Office, 2004. 5 “Advise and Assent,” editorial, The Los Angeles Times, February 19, 2006, p. 6. 7 Louis Fisher, “House Resolutions of Inquiry,” Washington, DC: Congressional Research Service, May 12, 2003. 8 Fisher, “Resolutions of Inquiry,” p. 17. 9 Scott Shane, “U.S. Reclassifies Many Documents in Secret Review,” The New York Times, February 21, 2006, p. 1.